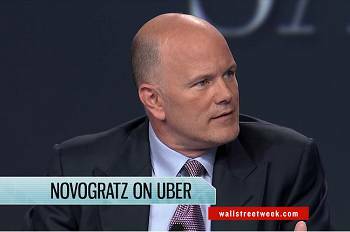 In an interview on Sunday's episode of Wall Street Week, Mike Novogratz, principal and director of investment firm Fortress Investments, who was speaking about corporate greed and income inequality, explained his thoughts with an anecdote about former Uber CFO Brent Callinicos. Callinicos, who had previously been a bean-counter at Google, announced his decision to leave his role Uber in March. Although Novogratz did not mention Callinicos by name, the anecdote is set during a period in which he was CFO. Novogratz began by noting that, regardless of whether America has had a Republican or Democratic administration, the percentage of earnings going to capital, versus labour, has decreased over the last 35 years. Mulling over this phenomenon, he recalled: "I had an interesting meeting with the CFO of Uber [...] and they were raising capital. [They] had started their [fund-raising] roadshow at twenty five billion dollars valuation, and a week later the valuation had jumped to forty." Uber had not replied to an invitation to comment at the time of publication.